I found this while Stumbling the other day. These words haven’t aged, have they? 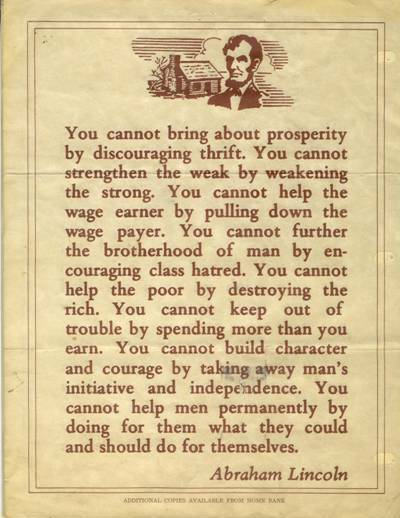 Great words of wisdom from Honest Abe. This should be written again in modern tongue and distributed to every mailbox in America. Wow. This is so true. It’s a slippery slope we are on and no one is sure where it will lead. I hope Obama can get us out of this mess. There’s so much that I agree with him on: universal insurance, getting out of Iraq, etc., but I’m worried that big government is what he’s after. We definitely don’t need that. Other than the thrift and character statements, I disagree with everything. People are rarely poor due to laziness, fecklessness, etc, but far more frequently due to existing economic structures which strongly favour the rich minority over the working, and poor, vast majority. Lincoln was extremely prolific. One of the deepest thinkers that this country has ever known.